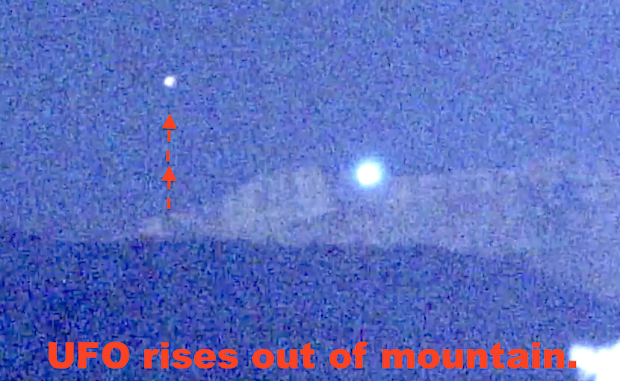 UFO SIGHTINGS DAILY: Glowing UFO Comes Out Of Mountain In Las Vegas, Nevada On Feb 27, 2016, Video, UFO Sighting News. Glowing UFO Comes Out Of Mountain In Las Vegas, Nevada On Feb 27, 2016, Video, UFO Sighting News. This is an excellent capture by Steven Barone as he uses his night vision to capture a UFO coming out of the top of the mountain. I hope to see more night vision from Steven. This is great evidence. I have a similar night vision scope I hope to use this weekend, but mine is 2nd gen green. This video was captured in the foothills and cliffs of the Pine Mountains near Red Rock Canyon and Blue Diamond which is very close to Las Vegas, Nevada on the night of February 27, 2016. This location is turning out to be pretty prolific when it comes to sightings of UFOs. I could never see what was going on in detail here until I got the night vision camera. It exposes much more and in this video, there are three strange objects including the bright light that always shows up in this particular spot. Using Google Earth I can tell this spot is very close to Blue Diamond which is alleged to be an underground saucer base. The second and third objects to appear came from the same location which should be the Blue Diamond area.